Departments of Computer Science & Engineering of Vasireddy Venkatadri Institute of Technology inaugurated Association of Computer Machinery (ACM) Student Chapter was officially chartered by ACM's Chief Operating Officer on November 06, 2017. 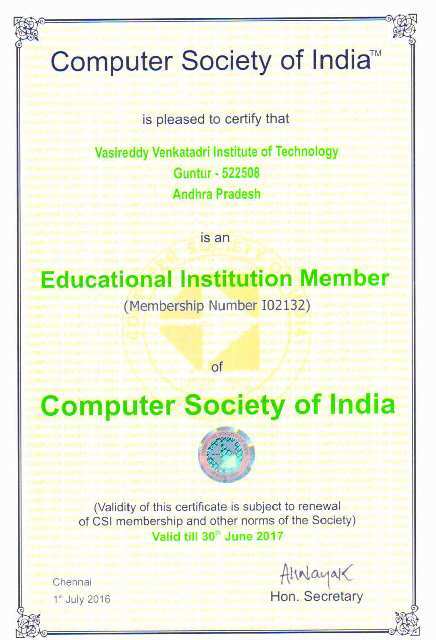 Departments of Computer Science & Engineering of Vasireddy Venkatadri Institute of Technology inaugurated Computer Society of India (CSI) student chapter on 31.10.2013 in the auspicious presence of Dr. D V L N Somayajulu Professor & Head, Department of Computer Science and Engineering, of National Institute of Technology, Warangal and it is renewed up to 30.06.2017. Workshop on Artificial Intelligence and Machine Learning by Srikanth Varna, cofounder of AAIC Technologies Pvt, Ltd.